Out of curiosity and in a baby step toward frugality and self-sufficiency, I have started a weed garden composed of the varieties of “weeds” that occur most prominently and persistently in my yard. I have uprooted them and transplanted them into containers of a variety of sizes to observe them only slightly removed from their natural habitat. I want to identify/classify them, learn about them, and figure out how to make them earn their keep. It’s not a renter’s market, and real estate in Brooklyn is not cheap. On top of that, with all of us being told we can become backyard farmers by trading in our $300 skinny jeans (which I personally never have owned but whose presence is nonetheless ubiquitous) for an equally priced pair of torn, ripped, and patched and otherwise used and abused vintage workerman’s dungarees, my little plot of land is screaming for the showiest and most table worthy vegetation gentrification. With that in mind, I am cleaning house on my weeds, trying to identify the ones taking up the most space and putting them all to work. Of course, many are already paying their dues, serving as decoys for the unwanted pests and attracting other, beneficial, ones. I don’t want to disturb the equilibrium and natural state of things too much – just want to be trying to get the most out of my yard’s inhabitants. That said, I’m starting by looking at a very common to this area plant, by the name of plantain, though it’s not the banana variety. Wildman Steve Brill recommends against eating it, simply because it’s not that tasty, but it’s widely hailed as a cure all for skin intrusions from mosquitoes to minor scrapes and burns. It’s best if used within 10-15 minutes of a bite; within that time, a quick treatment can fully cure a bite by removing the poison. Take a leaf, crinkle or smash it up between your fingers, and place it directly on the bite for a minute or so. The relief should be felt almost immediately. One thing I’m unsure of — anyone? anyone? — is if it is still effective when not immediately plucked from the plant. In other words, if you’re hiking and spot some, and want to take it along as an impromptu first aid kit, how long will it maintain its healing properties? This may be a question for the Wildman himself. Plantain is also a worker weed because it is deep-rooted and can help open up and break up soil to help water find paths to more fragile rooted plants. This is especially helpful in areas such as ours (NYC) where the soil is so heavily clay-like. Plantains? They’re keepers. Leave some in your yard close to more delicate plants (or try transplanting them), and keep some in a pot on your deck or near your front or back door for emergency aid when the mosquitoes get hungry. I found mine are thriving in planters (while other weeds are not do keen on such domestication). QUESTION: how are you putting your plantains to work for you? Go ahead … Gimme the dirt! I just recently came across something on plantains, and as you mentioned I immediately think of it’s banana like cousin. Last year I was using some dandelion leaves in salads, and after looking through Wildman’s book for an ID, I occasionally add wild violet leaves. I seem to get quite a few violets and wood sorrel. 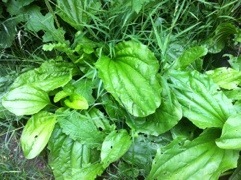 I’ve never transplanted weeds, when I pull some I usually just fling them toward the back. There are a number of weeds that are getting chewed up so maybe I should try to identify them for starters. I copied the following from an old out of copyright public domain book (which has no pictures). Based on suspicion alone, I am guessing the rapid application of the plantain has more to do with catching whatever it is before it has a chance to spread or get irritated more so than the plant being picked too soon before use. What I do remember Wildman saying was that Jewel Weed is good for the skin. You cut it into pieces and put them in a jar filled with Witch Hazel- which just reminded me that I have a small jar of it soaking since the tour. dry, a strong infusion of them proves relaxing and stimulating, acting on the skin and kidneys. nervine depurator. The insignificant appearance of the plant has led to its being slighted. much according to soil, the spike being from four to twenty inches long, elastic and tough. and low scrofulous ulcers. 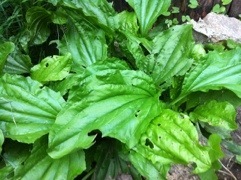 It should not be confounded with alisma plantago. articles, literally growing at our doors, are of valuable remedial powers. This is from 1869, so you should probably do more research in more modern references to confirm or deny what was said above.